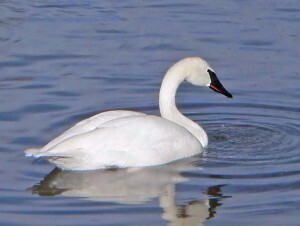 Trumpeter swans are the largest swans amongst all of North America’s waterfowls. It is one of the heaviest species of flying birds. This elegant bird got its name from its call. Their call sounds like trumpets. Find out all about this marvelous and beautiful bird below. 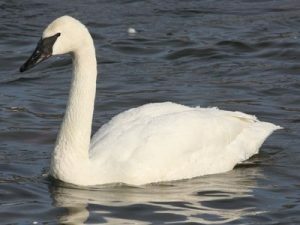 Length : Male trumpeter swans, also called cobs, range between 145 cm and 163 cm. in length. Lengths of females of this species, also called pens, range between 139 cm and 150 cm. 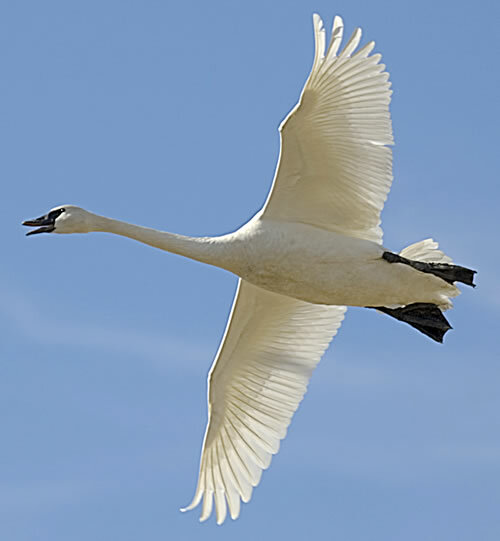 Wingspan : Wingspan of an average adult of this species of swan is 6.7 ft. Weight : Male swans weigh about 11.8 kg. Females weigh around 10 kg on average. Body : This species is large in size. Their bodies and heads are connected by a log upright held neck. Head : Their heads are small and round shaped. They have two, round and black eyes on two sides of their face. Their long, black bills start almost from corners of their eyes. Feet : They have one pair of padded, webbed toes that help them swim in water as well as walk on land. Color : These swans are clean white all over their head and body. Only starting from corners of their eyes till the end of their bills are black. Trumpeter swans are very interesting to observe. They are extremely social creatures. They always move around in flocks. They are territorial in nature. The cobs or male trumpeter swans float around their territory to guard the pens or female trumpeter swans and their eggs and young hatchlings from predators or fellow creatures’ invasion. These swans are monogamous in breeding nature. These are migratory birds. They migrate during the fall. During their courtship period they swim around together, blow water on each other and even engage in duet calling. These swans call making a hollow and nasal honking sound. While flying they make a raspy noise to let their fellow beings know about the departure. Their call resemble to mild trumpet beats. Adult trumpeter swans completely feed on plant materials. Leaves, weeds, stems and roots of aquatic plants form the major part of their diet. Grass and waste grain form part of their diet amongst the on-ground food items. They need the on-ground food supplies mainly during the fall. Juvenile swans eat mostly tiny invertebrates and insects till the first couple of weeks post-hatching. These birds fly at a speed of 40-80miles/hr. They mostly fly in flocks, being very social in nature. Trumpeter swans are distributed into three groups. The Pacific Coast region group is the largest amongst them. The second largest group occupies the Rocky Mountain. The smallest group inhabits eastern part of the Rocky Mountain. They are found mostly in isolated parts of western Canada, North America and western parts of U.S.A. The pacific Coast region flock of these swans migrates to western Canada and Alaska for breeding. A Canadian flock of the swans migrates to the Red Rock Lakes National Wildlife Refuge during the fall. During summer days theses swans inhabit shallow forested lakes, marshes and swamps. During the fall these swans move to sheltered coastlines and estuaries. These swans have many predators on land, sky and water. Common Raven, Wolverine, Common Raccoon, Brown Bear, American Black Bear, Coyote, Northern River Otter and Gray Wolf are the most dangerous predators of Trumpeter Swan eggs. Adults of this species are preyed by Coyote, Red Fox, Bobcat and Golden Eagle. Given the long list of predators of Trumpeter Swans mother nature has also endowed this species with some adaptive features enabling them to defend or prevent themselves from danger. Their long necks enable them to trace food from a distance. Their long bill helps them dig out aquatic plants even from a depth of feet down the water. Their necks also help them see their predators coming from a distance and they can hide or fly away or dive down under water in order to protect themselves. If the predator is on-ground then their flying and swimming abilities help saving themselves. These swans mate mostly between the months of April and May. Trumpeter swans are monogamous in nature, which means they mate for lifetime. Their courtship begins at the age of 2-3yrs. They build their nests on muskrat lodges. They also nest in places where the water level is maximum 3 ft. deep. They are very territorial beings. They use the same nest over and over again. Females of this species lay about 3-12 eggs per breeding season. Incubation period usually continues till 32-37 days. Both the parent swans raise the young ones. The tiny hatchlings start swimming out after 2-3days of hatching out into the light. They start looking for food. The parent swans train them by breaking small aquatic planktons and other plant materials, releasing them to float around water. First feather appear on the young ones after about a month from hatching and they get covered with feathers all over them after about 10 weeks. By the age of 15 weeks the young swans start learning flying. By this time they weigh about 9 kg and are close to adolescence. Male Trumpeter swans live for about 30-35 years. Females have a life span ranging between 25-28 years. According to IUCN records these swans come under the Least Concern category. This species is absolutely safe, given the easy availability of their diet and unthreatened habitat condition. Trumpeter swans are very easy to take care of and extremely fun to play with. Read their care sheet below. Housing : These swans like all other swans need water to swim around. They can be kept in the backyard. Take care of two things, tie their wings so that they cannot fly away, and keep a track that they do not loiter around in others’ compounds. Let them swim around in the backyard pool and chirp around in the lawn. Keep them under shed during rain and snowfall. Diet : Feed these swans their natural diet only, which is pretty easy to find. At the younger stage feed them aquatic planktons, small worms, insects, etc. Once they are a little grown up they could be fed with normal plant materials. If some supplement is needed to be fed then expert consultation is strongly advisable. Legal Issue : Before petting a Trumpeter swan see for all the legal terms of the respective state for petting this species. Get proper legal permission documents before bringing home one cute little hatchling of this species of swan. Else if any loop holes are left the cutest creature of the household could be taken away. 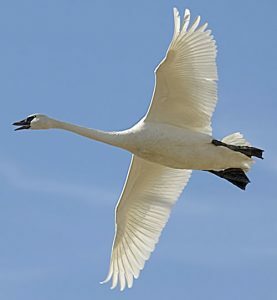 Trumpeter swan is a beautiful bird. It is as interesting in its characteristics as a treat to eyes. Find out some extremely interesting things about this beauty. Their calls sound like trumpet beats and thus their name is derived. Male of this species is called Cob, female is called Pen and young ones are called Cygnets. During the extreme hot summer months of July and August feathers of this bird shred, making them unable to fly. This is a flightless time span for these swans. They are monogamous in nature. 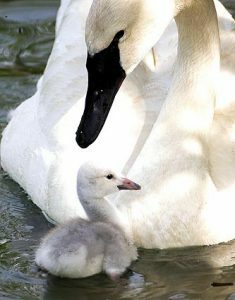 The parent swans teach the young ones to feed themselves as early as from the second day after hatching. FYI- it’s illegal to have ‘pet’ trumpeters in Iowa.